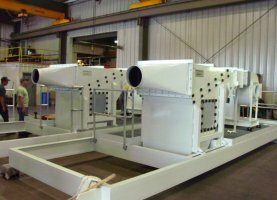 Our years of experience in custom fabrication makes us an industry leader in small fabrications that involve shearing, forming, drilling and tapping to large enclosures that require electrical piping with in house start up and testing. Welding capabilities include FCAW, GMAW, GTAW and SMAW on aluminum, stainless steel and mild steel. We are structurally certified in AWS DI.I.